thank you!! yep, i use the thai kitchen red curry paste. we love it! This couldn’t possibly be more catered to what I love, YES!!!! 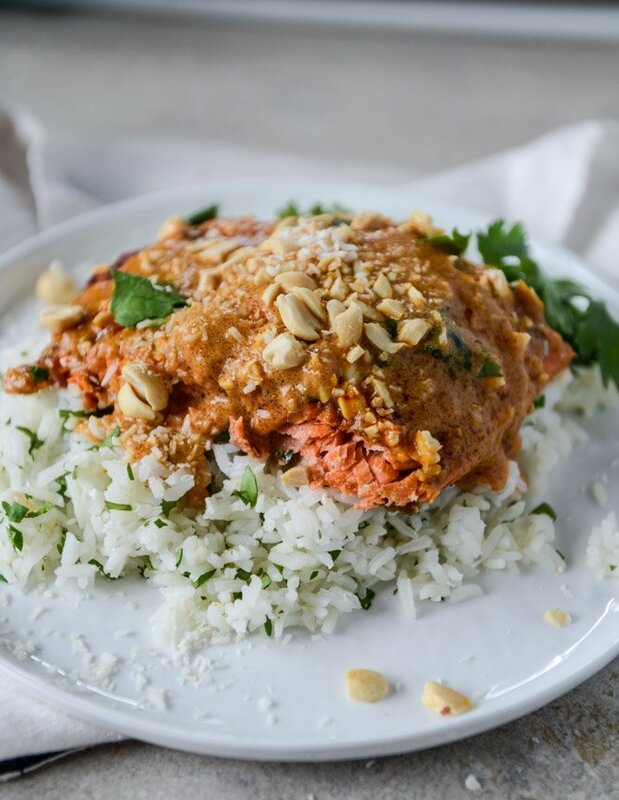 The salmon, the thai peanut sauce, the coconutty cilantro-y rice!!!!!! I can tell without even tasting it yet that this is such a major winner!!! i wish i had a giant plate of it right now. Thank you!! 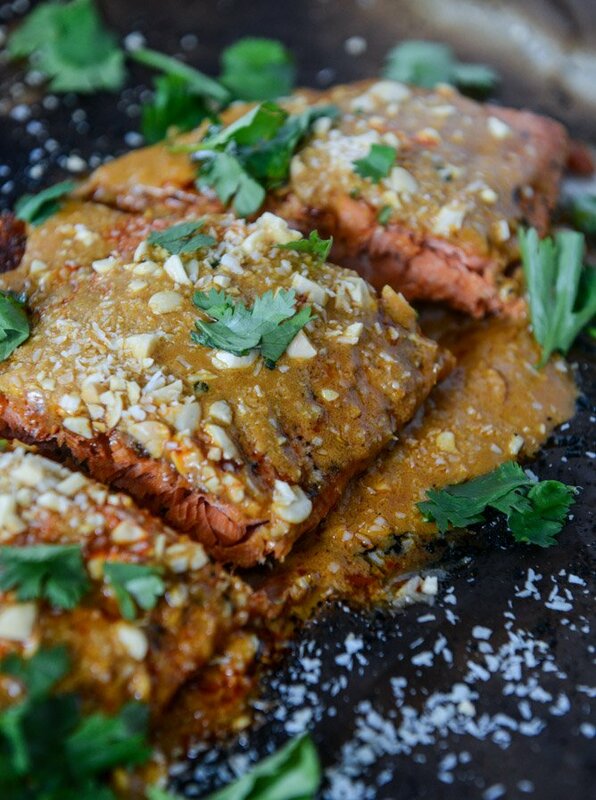 I feel like I’ve been in a serious rut with my go-to salmon recipes lately and this is just what I needed! So happy to hear your friend’s wedding was wonderful!! This looks so great, I can’t wait to make it. 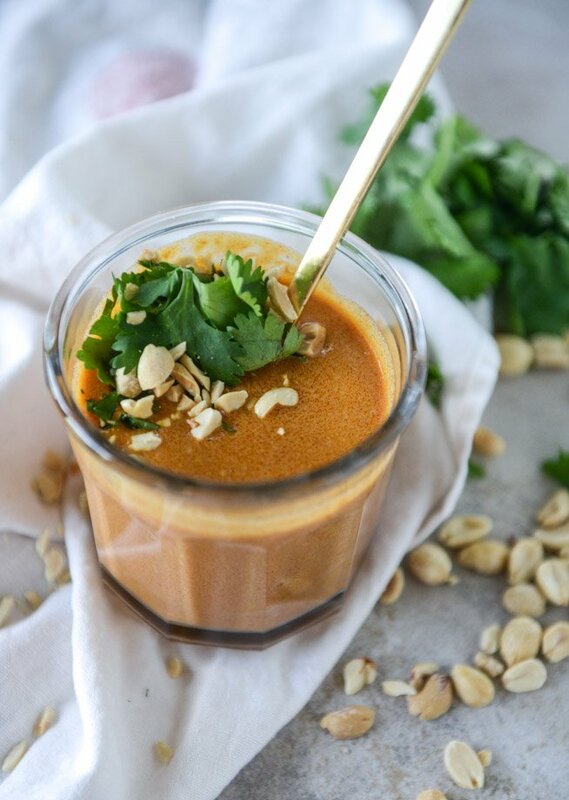 Peanut sauces are heaven on a plate! In love with this dish already! Especially that peanut curry – yum! Yum! Coconut rice is one of my favorites to make. Definitely want to try this recipe with tofu! i bet that would be really good too! ooh coconut in the rice too?!?! normally i just make plain rice, but creamy thai curry with coconut milk could only be better with coconut rice. Coconut rice AND peanut sauce? This sounds incredible! I haven’t tasted it yet and I already want to eat it forever. I tend to stick to the same two (delicious, but still…) salmon recipes, and now that’s gonna change. You are the best! This looks amazing. And yes, I did have a carbcation…but mine lasted 9 days. I need health in my life. Does a carbcation mean you don’t eat sugar? Or just no starchy carbs? haha oh my gosh – no i meant i ate ALLLLLL the carbs. bahahaha. O this is perfect, perfect all around!!! I could make this every day! two days ago grey McLaren. P1 I bought afterearning 18,512 Dollars..it was my previous month’s payout..just a littleover.17k Dollars Last month..3-5 hours job a day…with weekly layouts..it’s realy thesimplest. job I have ever Do.. I Joined This 7 months. ago. and now making overhourly. This recipe looks amazing! No wonder you want to make it as often as possible! 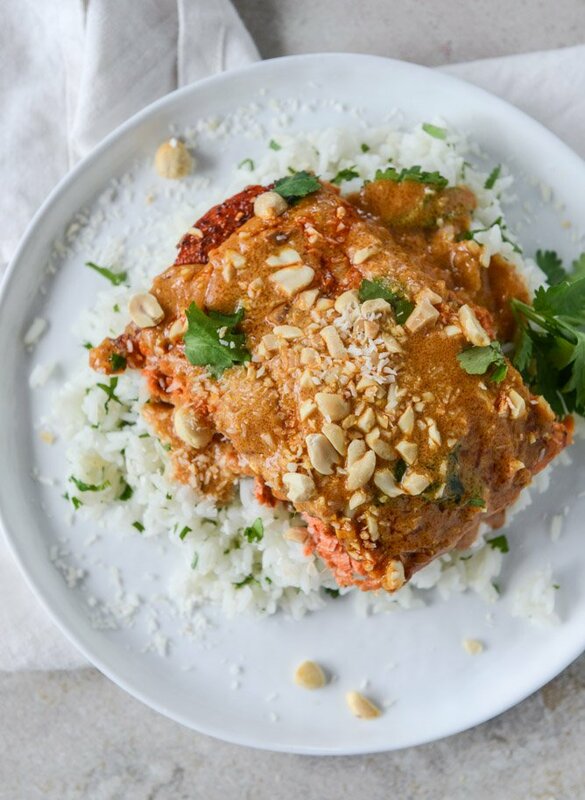 The combination of the peanut sauce and the cilantro rice sounds like a deliciously light summer meal! I’ve been looking at recipes for the last hour, trying to get inspired for dinner, and this stopped me in my tracks. My current favorite way to make salmon is your Cajun salmon with salted lime butter, which is going to be hard to top — thank you for bringing so much delicious fish into my life! I crave these flavors like crazy! This dish is a stunner. I like fish but not a big salmon fan. Maybe I’ll try it again because this sounds delish. Or maybe I’ll make salmon for my husband and chicken for me…because I’m super boring. Lol. this sauce would still be so good on chicken! Curry always looks like throw up on a plate, to me. As I read that back to myself, I see how offensive that sounds but I don’t mean it that way. More like, curry looks like throw up on a plate (always, no matter who posts or cooks it) but this looks so good that I don’t even care. funny enough, i really wanted to instagram a pic of this and thought the SAME THING. it really doesn’t photograph well. Definitely trying this next week! I am amazed, I don’t know how you do it. If I smother something in a sauce it looks unappetizing to say it mildly. You on the other hand make it look amazing. So going to make this, and maybe use the sauce on other things too. I love the list of ingredients. Sounds terrific. Made this last night and it was so good! I don’t like fish much but made it because my husband does. I could not get enough of this and we had extra sauce that we are keeping for another meal. This will be a meal we make more than once a month! This looks so delicious! How long do you think the sauce will keep? Kindly add the proprietors of “Camp Jeff and Owen” to the list who would like to shout from the roof, how freaking wonderful this contribution of yours was. My only deviation was to do individual 8 oz. center cut fillets instead of one large side of Salmon. We (and our guests) went cuhrazy for this! Thank you so so much. And WOW, that Coconut rice!!! Hi Jessica! I’m such a big fan of spicy curry dishes, what could I add to this to give it that HOT Thai flavor? I don’t want to ruin it so I thought I’d ask the expert! Wow, this recipie is fantastic! I’ve made it twice now, the second time I added chopped mushrooms and courgettes which made a nice edition. I love the combination of the coconut in the rice and with the sauce. Delish!! I’m not normally a salmon person, but holy cow. This was so yummy. I think next time I will have a bit more curry paste in the sauce, and a little less peanut butter. The spice rub was golden and so was the rice… I mean really. YUM. Made this tonight and loved it! Thanks for the recipe. The only issue I had is the sauce– it tasted good but was very runny. Seems like a few words are missing from the recipe when you say “Bring the mixture.” What is that step? I tried to get the mixture to reduce and it just didn’t happen… Do you have any tips, or is it supposed to stay pretty runny? All in all though, no complaints. Delicious! I made this for dinner last night and it was really delicious and easy to make. The curry sauce was runny when I put it all together, but I brought it to a soft boil then let it simmer on the stove while I prepared the salmon and it thickened up nicely. Could eat the sauce with a spoon, for sure. Thanks Jessica! I made this for the THIRD time last night, which is basically a million times because I never make anything twice. So so so good. Even my 10 month old gobbled it up! What’s the calories in this superb recipe? I can work it out but was just asking as I’m being lazy. We tried this out last night. Yum! We loved the salmon with that rub. That was seriously tasty. The sauce and rice were also delicious. I am a big fan of coconut rice. 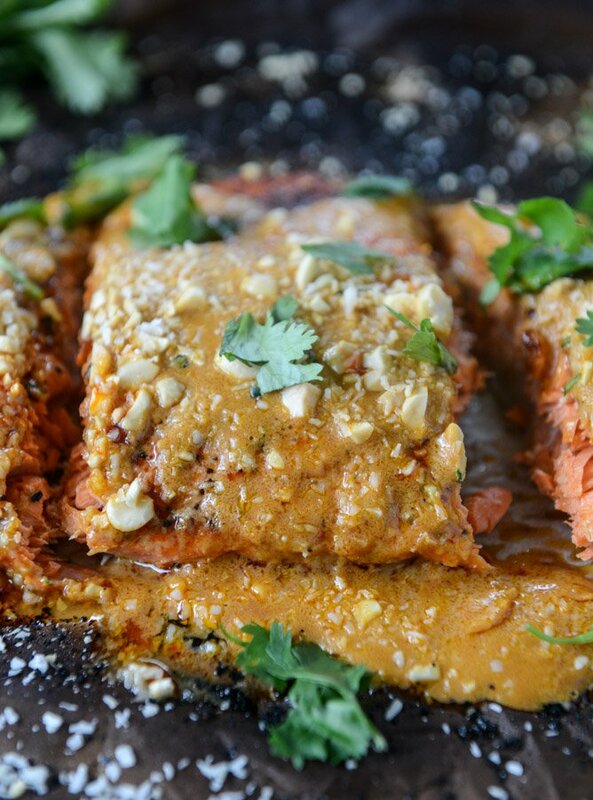 That salmon though…I think we’ll be making that again. My husband and I made the salmon and sauce for dinner tonight (with soba noodles) and it was SO delicious! We are big fans of Thai food and I’m happy to say that after trying many homemade sauces, this is the one I’ll be making over and over again. Thanks for the recipe! I made this today – it’s incredible! Thank you so much! I can’t wait to try this. Have you made it w riced cauliflower rather than rice? I’d be curious to know how long it would need to cook so the coconut milk evaporates.